In a landmark decision on Monday, the Supreme Court struck down Texas’s House Bill 2, the restrictive abortion law that could have shut down nearly half of the state’s abortion providers. 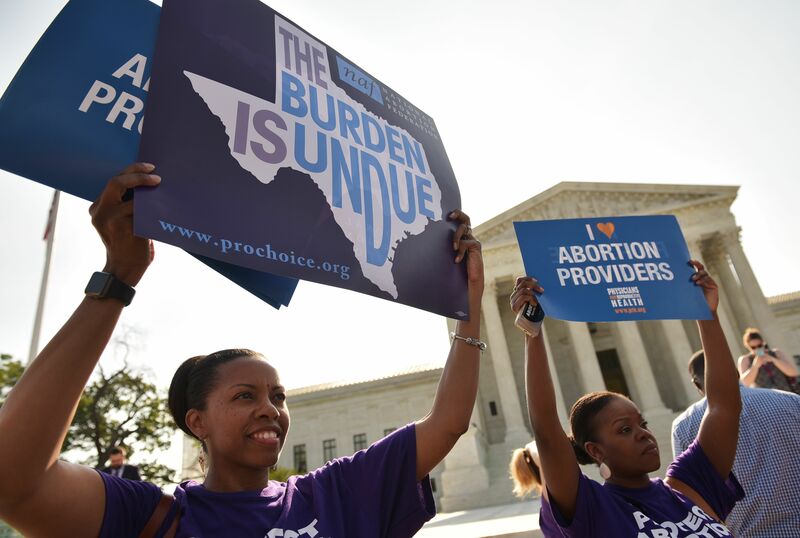 It’s worth taking the time to read the women’s health ruling from the Supreme Court in full; delivered by Justice Stephen Breyer, it argues that HB2 places an undue burden on women’s access to abortions and is, therefore, unconstitutional. Although the SCOTUS ruling will have the power to affect how states all over the country can regulate abortion, in this case ( Whole Woman’s Health v. Hellerstedt ) the Court considered the constitutionality of two key provisions of Texas’s House Bill 2: One requires that doctors who provide abortions must have admitting privileges at a hospital within 30 miles of the abortion facility, and the other requires that clinics providing abortions must meet the building standards of ambulatory surgical centers. Critics have argued that these provisions are typical of TRAP laws (“TRAP” stands for “targeted regulation of abortion providers"), laws that attempt to restrict or eliminate abortion by making it impossible for abortion providers to meet strict, and unnecessary, regulations. Often these regulations are presented under the guise of promoting women’s safety and health, but their ultimate purpose, critics argue, is simply to make it harder for women to get abortions. And when it comes to restricting abortion access, these laws are extremely effective: Since HB2 was passed in 2013, 23 of Texas’s 42 abortion clinics have closed, leaving only 19 facilities open in a state of over 26 million people. If SCOTUS had ruled to uphold of HB2, almost half of the remaining Texas abortion clinics could have been forced to shut down. We conclude that neither of these provisions offers medical benefits sufficient to justify the burdens upon access that each imposes. Each places a substantial obstacle in the path of women seeking a previability abortion, each constitutes an undue burden on abortion access, Casey, supra, at 878 (plurality opinion), and each violates the Federal Constitution. Breyer was joined in the decision by Justices Anthony Kennedy, Ruth Bader Ginsburg, Elena Kagan, and Sonia Sotomayor. Among the dissenters were Chief Justice John Roberts and Justices Clarence Thomas and Samuel Alito. [I]t is beyond rational belief that H. B. 2 could genuinely protect the health of women, and certain that the law “would simply make it more difficult for them to obtain abortions.” … When a State severely limits access to safe and legal procedures, women in desperate circumstances may resort to unlicensed rogue practitioners, faute de mieux, at great risk to their health and safety. You can read the Supreme Court’s full decision on the Texas abortion case here.